The Election rhetoric is taking a lot of money out of the markets!!! I know you do not want to hear this but when parties in a presidential election go low. And I mean as low as you can get it scares the markets. The threats of a civil war, that a person will be receptive to the KKK and also rhetoric much worse than that add to the markets volatility. The U.S. used to me a model for the world as to the success of Democracy and how it gave hope to everyone across the globe. Somehow that message has been lost. And the low bar now that politicians are taking across the country is doing its toll on the markets and yes the citizens of this country. The idea that we in America are all for one and one for all is now a foreign concept. It in no way describes the state of America today. We now are at risk if this continues for the markets to take a plunge with a massive amount of wealth wiped out due to Americans refusing to do business with people of a different political persuasion or who think differently on issues. Rather than rational discussion we are at the point of boycotts and in some instances violence against other that think differently. This as I see it is not the peoples fault. Its the leaders who are adept at changing public perceptions to fit their Ideology. It is times like this that reinforces my belief that being an Independent who is issue driven is the only way to go. To hear politicians on both sides talk in lockstep to what their party wants them to say is disgusting to me. Where are our independent leaders who have our welfare #1 for priority. Think hard, and you will see that they are not easy to find. The ones that speak the unpopular solutions but are best of the Citizens of this country. The ones that forgo the easy money funneling in from foreign countries to influence those that take it at the expense of us….WE THE PEOPLE!!! Now I comment on this not only as it effects the markets today but because I have reached the boiling point as I am sure most Americans have with our politicians on both sides. They treat the whole process as a game where the goal is to see who can accumulate the most money for themselves through their positions. It is not supposed to work that way. The two party system is supposed to provide checks and balances by giving Americans moderate choices on issues. In addition our institutions are designed to be fiercely independent so that we the people can be protected. The Supreme Court, House, Senate, DOJ, FBI Presidency are all supposed to do their jobs independent of each other so that we the people are protected. Then we have the final bastion of protection, The Press. It has been said that without a free and independent press Democracy is doomed. I suggest we are right on that edge as the Press is far from Independent. Nor do they wish to be. The press has lost its way. Go back and watch “Broadcast News ” with William Hurt. A 1987 movie where the ethical questions of a free press was the topic of the movie. You will scratch your head at how far the ethical boundaries discussed in the movie has changed. So this does not bode well for the long term progress of the markets. Short term we are due for a bounce. And large short covering bounce. But in this environment its going to be tough to get as we the people are scared at what is coming next from our leaders. Now many will think the above is sour grapes because I have on several mean reversion trades. Maybe, however they are relatively small trades and I am not that underwater on them as I have been legging into them and not yet at a full position. So, I can say the above is being said from a person who loves his country and is very concerned at the course we are one. I for one am ready to go back to “All for one and one for all”. I was gone for a day and perhaps that has effected me also. As I had the unpleasant task of burying my mother. Its a day that I will remember as one of the most traumatic of my life. So it has made me think a bit about what is important in life. And its not how fast politicians can get wealthy off of We the people!!! I promise you that this is my first and last tirade on the state of America. I have gone a bit over the boundary of the purpose of this site so that I can vent a bit about what I am observing around our country. Today breakout trades will be few and far between. Mean reversion perhaps but it would take a big move to the downside to get me interested in adding another position. I have been following you for years and been paying down my mortgage with your plays year after year. There is services out there that are 10x more expensive with nowhere near the data and thought that you put into your plays (not that I want you to raise your price! 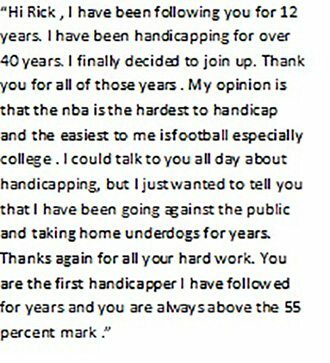 :)) and most of them are losing bettors (trust me I have been thru them all) I will say that this year too is the first year I have had a book quit me because I beat them so bad, not many services can say that. Thanks Rick! Just want to also say that I really enjoy following along with your plays and swing trades. Also really enjoy the blog, I read it every day. See sportswatchmonitor.com for documented 2016 in all sports. 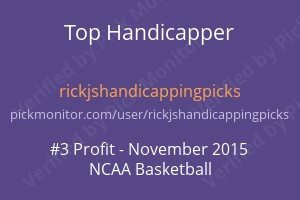 #4 of all handicappers for all results for 2016!! !